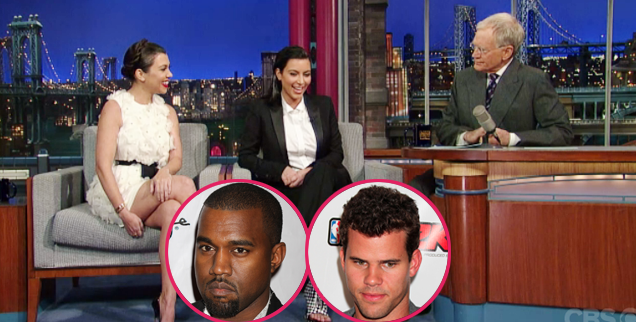 Dave Letterman Asks Kim Kardashian: ‘You’re Married To Two Guys Right?’ - Oh No They Didn't! Kim and Kourtney Kardashian opened up about Kim’s problems with her estranged husband Kris Humphries on Wednesday’s edition of the Late Show With David Letterman. 'Now, you’re still married to the former husband, Kris Humphries? You’re still married to him?” he asked Kim, which she confirmed. The two got then into specifics about Kim’s ongoing legal battle with the star forward for the Brooklyn Nets, who wants to have their infamous 72-day marriage annulled based on fraudulent circumstances. Later on in the chat, Kim told Letterman his ongoing jokes about her notoriously brief marriage to the NBA star “have to stop” because, technically, her marriage has lasted much longer than 72 days.